SP Intermodal Fans, Here They Are! This is the month for SP and Intermodal fans! The first SP release is 60’ beer cars. A runner pack and a single have been released. The runner pack is item 90260-1. The road numbers are: 691657, 691659, 691649, 691664. The MSRP is $120.00. The single car is item 91260-1. The road number is 691690. The MSRP is $34.00. The second SP release is waffle side gondolas. These cars appear with a placard for SP on the sides. A runner pack and a single are available. The runner pack is item 90240-1. The road numbers are: 333529, 333530, 333566, 333573. The MSRP is $117.00. The single car is item 91240-1. The road number is 33574. The MSRP is $32.00. A new set of CP NSC 53’ well cars have been released. The runner pack is item 90602-5. 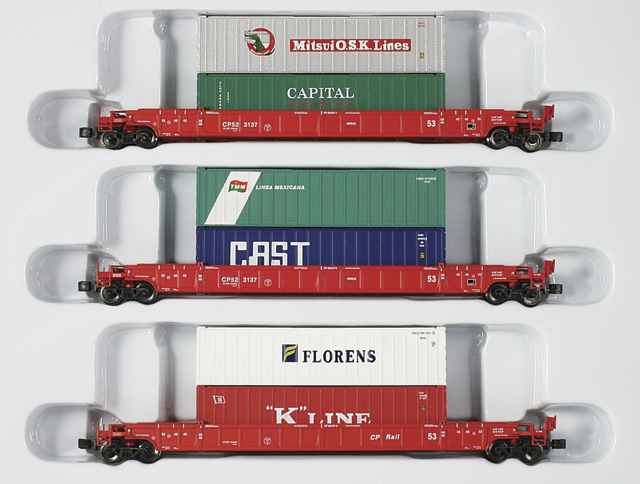 The set comes with six 40’ containers lettered for Mitsui, Capital, TMM, CAST, Florens and K Line. The road numbers on the cars are: 523137A-523137B-523137C. The MSRP is: $133.00. * Note this set is in limited supply and is nearly sold out at the manufacturer. AZL is excited to announce the immediate availability of 89’ RTTX flat cars. These cars feature a die-cast metal chassis, AZL roller bearing truck with AutoLatch™ couplers and pin holes to accommodate containers of various sizes. Each car also comes with trailer hitches. These can be installed in the raised or lower position. These parts are under the insert in the packaging. A runner pack and single is available. The runner pack is item 90151-2. The set comes with four cars with road numbers: 991777, 992680, 980757, 981737. Seven containers come with the set. Six 40’ containers are included. 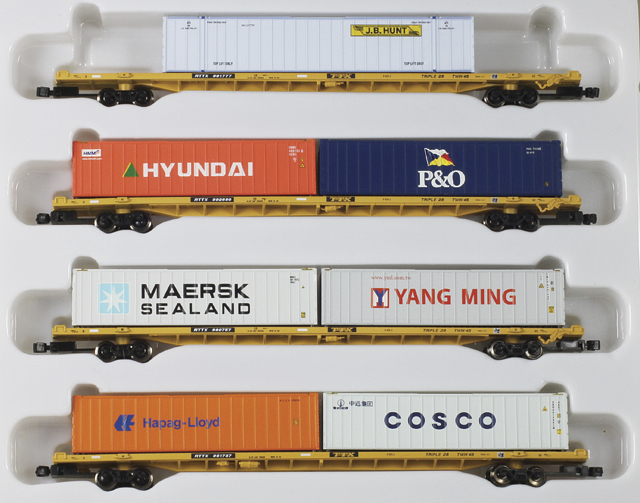 They are lettered for Hyundai, P&O, Maersk, Yank Ming, Hapag-Lloyd and Cosco. A single 53’ container for JB Hunt is included. The MSRP is $169.00. The single car is item 91101-4. It is road number 991972. Two 40’ containers are included. They are lettered for Mediterranean Shipping and ZIM. The MSRP is $49.00. 1MB zipped file. Full size images.